The Department of the Interior University (DOIU) has developed hundreds of online self-paced courses. Over the years, software and web needs are constantly changing and upgrading, rendering old courses unusable. Other concerns that impact course relevance are: monitors increase in size, the department gains new/fresh photography, accessibility laws and guidelines change, procedures are updated. Graphically, the photography and design treatments naturally become somewhat stale and old fashioned over time. For the last 10 years, approximately 150 courses have been created with the same basic template. 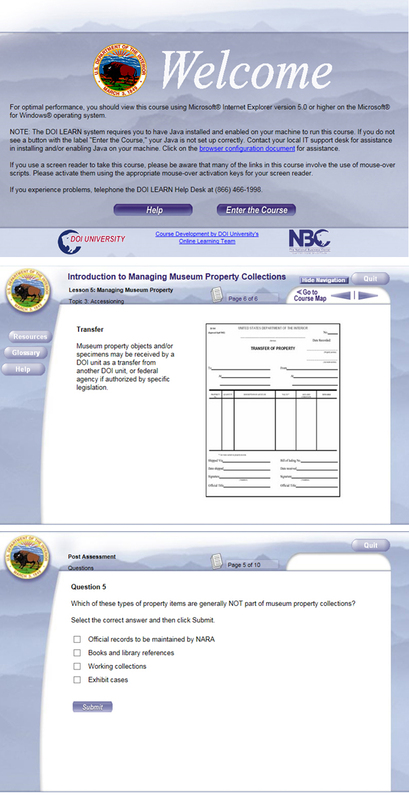 The Managing Museum Property Collections course is both non-functioning and uses the old template. It was built with very old software, and all of the graphics and photography needs updating. The monitor size is almost half of what is currently standard, and the design is very dated. I came up with two new GUIs (graphic user interface). In one design solution, there is a landscape photo of Dream Lake, with brown and gold color scheme. I chose to play with the title text, by choosing a font treatment (you should only use web-safe fonts such as Arial on websites), adding a bevel, and a more realistic drop shadow, and I built the info graphics to be visually rich in Photoshop. The second design solution has a deep blue background of a photo from Ellis Island, all of the text “live” in Lectora by only assigning a color to the text, rather than an effect, which would make it an image. In the Ellis Island version I tried to keep as much as possible in Lectora, rather than designing in Photoshop. There are two main benefits to this approach. One is that eReaders for the non-sighted have an easier time telling what is on the page. The second benefit is that Lectora will catch spelling errors. In both layouts, I chose to redesign the page with the largest amount of text provided. That way when the chosen template is applied, there will be an ample amount of space for the materials to be displayed. Both new GUIs have the welcome page, a bullseye infographic page, a ladder infographic page, and a quiz page for reference.The SME chose the Dream Lake version to apply to the course refresh. Please see below for screenshots of the new designs, and the old versions. Dream Lake Version (heavier use of Photoshop, specifically in infographics). This is the version that the SME chose. The old version which doesn’t work anymore.